gimel – the third letter of the Hebrew alphabet. Our Sages teach that the gimel symbolizes a rich man running after a poor man, the dalet, to give him charity. The word gimel is derived from the word gemul, which in Hebrew means both the giving of reward as well as the giving of punishment. In Torah, both reward and punishment have the same ultimate aim the rectification of the soul to merit to receive God's light to the fullest extent. Reward and punishment imply that man is free to choose between good and evil. (The teaching of the gimel thus refers back to that of the open left side of the beit, from which it is born, as explained above.) The Rambam (Maimonides), in particular, places great stress upon free choice as being fundamental to Jewish faith. According to the Rambam, the World to Come, the time of reward, is a completely spiritual world, one of souls without bodies. On this point the Ramban (Nachmanides) disagrees and argues that since complete freedom of choice exists only in our physical world, the ultimate rectification of reality the reward of the World to Come will also be on the physical plane. Kabbalah and Chassidut support the opinion of the Ramban. This is alluded to by the leg of the letter gimel which expresses the running of the rich man to bestow good upon the poor man. Running, more than any other physical act, expresses the power of will and freedom of choice (the Hebrew word for "running," ratz, is related to the word for "will," ratzon). In running, the leg is firmly in contact with the earth; through an act of will, the soul directly affects physical reality. The final reward, the ultimate revelation of God's Essential light, will thus justly be bestowed upon the soul in the very same context as its life's endeavor, the physical world. The Torah says: "Today [in this world] to do them," from which the Sages infer: tomorrow [in the World to Come] to receive their reward." Only "today" do we possess the opportunity to choose between good and evil. And so in accordance with our choice do we, ourselves, define the reward and punishment of "tomorrow." Just as evil is a finite phenomenon, so is punishment. Not so good and reward, which are truly infinite. The gimel of "today" is the secret of better one hour of teshuvah and good deeds in this world than all the life of the world to come. The gimel of "tomorrow" is the secret of better one hour of serenity in the world to come than all of the life of this world. A vav with a yud as a foot. A person in motion. * The running of the rich to the poor, the full to the empty, inherent in nature. * The run and return of the soul between its Divine source and physical abode. * The hand of Jacob grabbing the heel of Esau. * The constant progression of the Jew. * The expansion and contraction of the Infinite Light in the process of Creation. * The camel's journey through the desert of this world. * The camel symbolizes the angel of death. * A bridge; the connecting force inherent in nature. 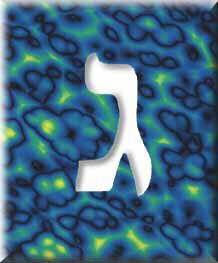 * Primordial matter and Divine wisdom. * The soul nursing from its Source. * The process of weaning through which a person learns to be independent. * God's continuous bestowal of lovingkindness and the weaning of the tzimtzum. * The obligation to emulate God by giving to others. * Numerical symbol of stability and balance. * Equilibrium between the three primary elements of Creation: air, water, and fire. * Three Fathers: Abraham, Isaac, and Jacob. * Three divisions of Jewish souls: kohanim (priests), Leviim (levites), and Israelites. * The segol and the segolta. * Three parts of the Torah: The Five Books of Moses, the Prophets, and the Writings. * "Three bonds are bounded together: Israel, Torah, and God."